Here, the components of D orthogonal to s have been expressed in the form s X D. The disturbance torques along s can only produce small fluctuations in the magnitude of the angular momentum vector, L=Ls, and therefore have minimal effect on the attitude dynamics. The disturbance torques along the spin axis have been neglected in Eq. (19-18), and L is assumed to be constant. In writing Eq. (19-22), it has been assumed that the disturbance torques are independent of the attitude over the range of the integral. This assumption is valid for maneuvers involving small arc motions, but becomes questionable for large maneuvers. Equations (19-17) and (19-18) determine the satellite attitude history and Eqs. (19-23), (19-24), and (19-26) provide the framework for obtaining the desired coil state history. However, Eq. (19-26) is not deterministic because X is a free parameter. Also, Eq. (19-23) does not fix the initial phase (t/>9) of q in the spin plane. Equation (19-26) shows that parameters, X, <j>q have a strong influence on the coil state history. Whenever the maneuver is feasible, there will be paired sets of values of (X,^) which allow the desired attitude to be reached. The feasible values of (X,«^) then parameterize the paths for which the integral J is close to being extremum. Among these paths, the one requiring the least amount of coil-on time is the minimum energy path and the corresponding coil commands are the energy optimal commands. To obtain the minimum maneuver time commands, note that in Eq. (19-26) if J /X = 0, then the coils will always be on in either the positive or the negative sense. As before, more than one "nearly extremum" path is possible. However, they need now be labeled by only one parameter, Thus, the generation of commands for minimum time maneuvers involves only a one-parameter search. A byproduct of the minimum time maneuvers is the determination of the final attitudes that can be obtained as the parameter <f> is varied. Thereby a boundary can be generated about the initial attitude sucn that all attitudes within this boundary will be attainable within the prescribed time. The attitude within the boundary that is closest to the desired attitude can be determined and the corresponding minimum time commands can be generated. Thus, a single algorithm can be used for minimization of time, energy, or arc-length error. Details of the implementation of this algorithm are given by Werking and Woolley . The main function of a spin plane magnetic coil is to control the magnitude of the spacecraft total angular momentum, which we will call simply the momentum. 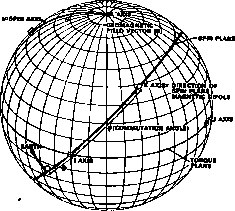 On most spacecraft, orientation and momentum control are handled separately by dipoles mounted along the spin axis for orientation control (Section 19.1) and dipoles mounted perpendicular to the spin axis for momentum control. However, orientation and momentum control can be strongly coupled in spin plane magnetic coil maneuvers. For low-inclination orbits, where the spin axis is closely aligned with the geomagnetic field vector, the spin axis coil is inefficient and the spin plane coil may be a better choice for both momentum and attitude control. Spin plane magnetic coil maneuvers can be carried out on both spinning and despun spacecraft, although the types of commands are different for each. The inertial coordinate system in which the magnetic control torque is most easily calculated is shown in Fig. 19-3. 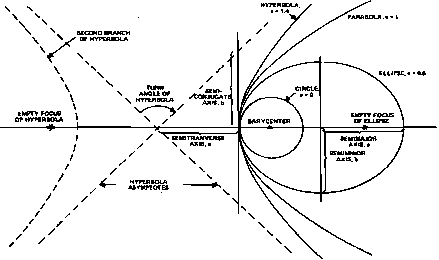 Here s is the spin _ axis and B is the geomagnetic field vector. We define an orthonormal triad i, j, k, which is assumed field. The geometry is shown in Fig. 19-3.
where we assume that A/ is an integral multiple of the spin period. Equation (19-29) shows that the available angular momentum changes form an ellipse in the plane perpendicular to the geomagnetic field vector, B. We may think of both orientation and momentum maneuvers as simply changing the spacecraft's angular momentum vector, L; specifically, attitude maneuvers change the direction of L, or the spin axis, s, and the momentum maneuvers change its magnitude. Given the geomagnetic field and the initial target angular momentum vectors (Lj, and Lr), we wish to generate a set of commands which may be used to carry out the maneuver. The commands consist of coil-on and coil-off times and commutation angles, which are kept constant for the duration of each command. In addition, we may wish to minimize the number of commands to achieve Lr or to minimize coil-on time for energy minimization. We will assume that new commands are generated every n minutes; that each command. /, results in a change, AL,; and that t is the tolerance on Lr. Q lies in the (L,Lr) plane and is perpendicular to L.
From the two solutions for \p, we pick the one for which AL Q>0. For the efficiency angle and the convergence limit, the same parameters can be used as for type 2 maneuvers. After the commutation angle has been determined, it must be translated into a hardware command. This can be done using the measured magnetic field directly as on SAS-3 [Gambhir and Sood, 1976] or using an Earlh horizon sensor, as on the AE series [Phenneger, et a/., 1975]. In the latter case, the commutation angle is referenced from the nadir vector, whose orientation is sensed onboard: in this case, an extra rotation angle, <J>, is added, which is measured from the nadir vector. E, to the i axis, as shown in Fig. 19-3. The above discussion is valid for fixed reference vectors. Because the magnetic reference vectors and, consequently, the optimal commutation angles are continuously changing, the commutation angles computed at any time i do not remain optimal for the duration of the command. To achieve a solution which is more nearly optimal we perform instead a discrete sequence of commands, each lasting for a specified time interval. Here the objective is to minimize the difference between the magnitudes of the target and actual angular momenta. For type 2 maneuvers, we wish to minimize the angle between the target and the actual angular momentum vectors. Thus. Finally, for type 4 maneuvers, no optimization is required because the objective is met by selecting the commutation angles to be 0 or v.
Having chosen a maneuver type, the next step is to find the solution of the optimization function, F. Although various nonlinear programming techniques can be applied (see Sections 13.4 and 13.5), we will use the gradient search method to obtain an iterative solution. An initial guess is first obtained. This may be done. where A is a constant selected by trial and error to make the iterations converge as quickly as possible. If X is too large, the iterations may oscillate and never come very close to the optimal solution. If X is too small, the iterations approach the optimal solution only very slowly.